Cover of the Program from the 1996 UK Tour The Musical equivalent to watching a trapeze act without the net! Performing since 1988, South Africa's most enduring theatrical success story, now at the peak of their creative powers. Running for twelve years the group's stalwarts, Graham Weir and Christine Weir, are now joined by actor-writer, Adrian Galley, and musical actress, Neisha-Anne Harley, who blend seamlessly into the group adding a wealth of fresh appeal. The show's emphasis turned to their original songs and compositions. Singing like angels, but with a devilish wit, they have been hailed both nationally and internationally for their unique blend of harmonies, humor and original writing. The exquisitely talented a cappella-singing-wizards feature a range of original material and goonish skits, alongside a mischievous treatment of classical and evergreen favourites. The show is 90% South African music, including songs by writers James Phillips and Roger Lucy. ". 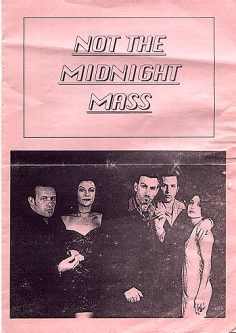 . . see why Not the Midnight Mass deserves the rousing, standing ovation they so effortlessly evoke"
". . . this inspired smorgasbord of musical delights will cheer and thrill the most eclectic of audiences"
". . . Masses of talent . . .pure vocal dexterity mixed with a huge dollop of fun"
". . . unquestionably the most polished, to a high gloss in fact, of all the inarnations of the group"
". . . vermaak jou onophoudelik met 'n stroom gehaltemusiek en spitsvondigheid"
" . . . . Graham Weir's deeply moving "Eh Bahran", a song about human aspiration and minedumps, and "Sad Day", a song about rain, bringing the chaotic streets, dust and thunderstorms of Johannesburg to vivid life." " . . . You know that a musical revue is really exceptional when the self-penned numbers stand out above the cover versions. Such a show is Not the Midnight Mass"
"Graham Weir's "Eb Bahran" is one of the country's most stirring anthems"
"Graham Weir is a composer of technical brilliance and his voice has imaginative power"
Die musikale eweknie daarvan om 'n sweefstokkunstenaar sonder 'n vangnet dop te hou. Na elf jaar op die planke kan NOT THE MIDNIGHT MASS tereg Suid-Afrika se langdurigste teaterverhaal genoem word. Op die hoogtepunt van hul kreatiewe vermoëns lei hul ons die 21ste Eeu binne met 'n blinknuwe vertoning. Die groep se steunpilare, Graham Weir en Christine Weir word bygestaan deur jazz-diva- komponis Tina Schouw en akteur-en-skrywer Adrian Galley wat 'n vars aanslag verskaf. Daar word gefokus op die oorspronklik komposisies en treffers van die groep. Die groep het reeds plaaslik en oorsee groot lof ingeoes vir hul uitsonderlike mengsel van harmonieë, humor en oorspronklike skryfwerk wat 'n wye verskeidenheid oorspronklike werke, immergroen gunstelinge en klassieke werke insluit. Hulle sing soos engele, maar met duiwelse vernuf. 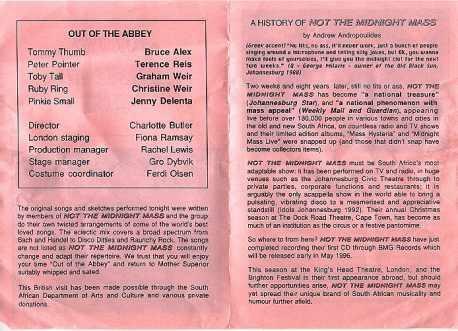 (English translation: After eleven years on the stage, NOT THE MIDNIGHT MASS can rightly be named South Africa's most enduring theatre phenomenon. At the height of their creativeness, they lead us into the 21st century with a brand new show. The group's pillars, Graham Weir and Christine Weir are joined by jazz diva and composer Tina Schouw and actor/writer Adrian Galley that offers a fresh approach. The focus is on the groups original compositions and hits. The group have already gained high praise both locally and overseas for their exceptional harmonies, humour and original material that includes a wide variety of original works, evergreen favourites and classical works. They sing like angels, but with devilish wit. April - July 1992 - Black Sun Theatre, Johannesburg - "Great Hits"
April 1993 - Dock Road Theatre, Cape Town - "Return Sell - Out Season"
Dec 94 - Jan 1995 - Dock Road Theatre, Cape Town - "Another Return Season"
Dec 99 - Jan 2000 - Baxter Concert Hall, Cape Town - "Millennium Mass"
July 2000 - Agfa Theatre on the Square, Sandton, Johannesburg - "21st Century Mass"
July 1992 - Grahamstown Festival - "Mass Hysteria" and "Mass Debate"
October 1997 - "Bread" tour at the Standard Bank Arena, Johannesburg. August 2000 - "Oppie Koppie"
March 2001 - "Spier Amphitheatre, Stellenbosch"